Too many good players to pick from and there's a stiff competition in the keeper's category as well. 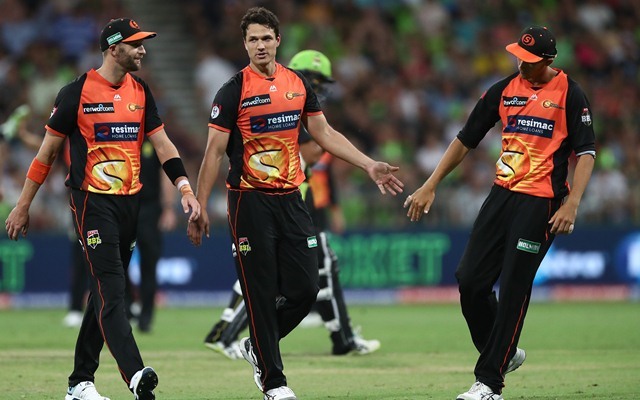 The second game of the doubleheader on Sunday will see the Perth Scorchers play hosts to the Melbourne Stars. The Scorchers are already out of the semi-final race in this edition of Big Bash League (BBL). In twelve games, the side has only managed to win three and occupy the last position on the points table. They have lost four games on the trot and will hope to do well in the last two games of the tournament. The Stars, as well, will be just as keen to get a win under their belt. For, they’ll almost seal the knockout berth with a win here. The team has got three games still left in the tournament and they will aim for nothing less than a hat-trick of wins so that they can fancy a spot in the top two. The team already won all its previous three games. The 51st match of the Big Bash League (BBL) 2018-19 will be played between Perth Scorchers and Melbourne Stars at the Perth Stadium. The match starts at 6:15 PM local time (10:15 AM GMT) (3:45 PM IST). The game will be live on Sony SIX and Sony SIX HD in India. Live streaming for this match is available on Sony Liv. The Perth stadium witnessed low scores in the first two games that it hosted this season. However, the next three games were high scoring ones with over 350 runs being scored in the game. The pitch definitely seems to assist batting at this point in time in the tournament. Even though the Scorchers were bowled out for just 79 runs in the last game, they wasn’t anything wrong with the surface. Chasing teams won five out of six games this season. Overall, the team batting second lost only two games at this venue. Cameron Bancroft, Michael Klinger, Mitch Marsh (C), Ashton Turner, Nick Hobson, Hilton Cartwright, Andrew Tye, Clint Hinchliffe, Matt Kelly, Jason Behrendorff, Nathan Coulter-Nile. Bench – Liam Guthrie, Josh Inglis. Ben Dunk, Marcus Stoinis, Peter Handscomb, Glenn Maxwell (C), Nic Maddinson, Dwayne Bravo, Evan Gulbis, Liam Plunkett, Adam Zampa, Jackson Bird, Jackson Coleman. Nathan Coulter-Nile recovered from his hamstring soreness while Shaun Marsh is out due to the same injury. Michael Klinger might be playing his last BBL match in case he isn’t included in the squad for the next game. Since 1 January 2019, Marcus Stoinis has featured in 8 games. He has been brilliant both with the bat as well as the ball ever since. He scored 364 runs and picked up 18 wickets during this period. Since he wasn’t included in the playing eleven for the second Test against Sri Lanka, he will be playing the upcoming BBL match. Marcus Stoinis is a must as a captain or vice-captain given the kind of form he has been in. Cameron Bancroft, Peter Handscomb and Dwayne Bravo are the other options from whom you can pick the second multiplier. Andrew Tye, Ben Dunk and Ashton Turner won’t be bad picks either. If you are still looking for alternatives, it is advisable to pick one among Glenn Maxwell, Liam Plunkett and Michael Klinger. The Melbourne Stars are predicted to win the match. 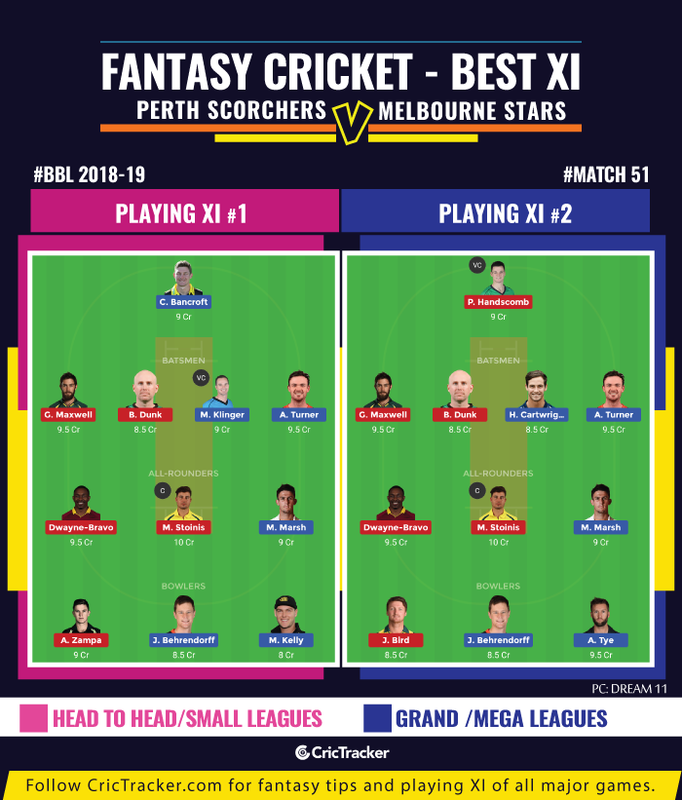 Get the latest Cricket News and updates from Big Bash League, Match Predictions, Fantasy Cricket Tips and lots more on CricTracker.com.